Many of my recent quilts are part of a continuing series of abstract geometric and impossible shapes inspired by Victor Vasarely, Oscar Reutersvard and M.C. Escher. The hand-dyed and beaded knot incorporates a 24-step gradation creating the illusion of dimension, while the 140 brown commercial fabrics provide opposing value to contrast the knot's blue. Machine quilted in a swirling watery design. 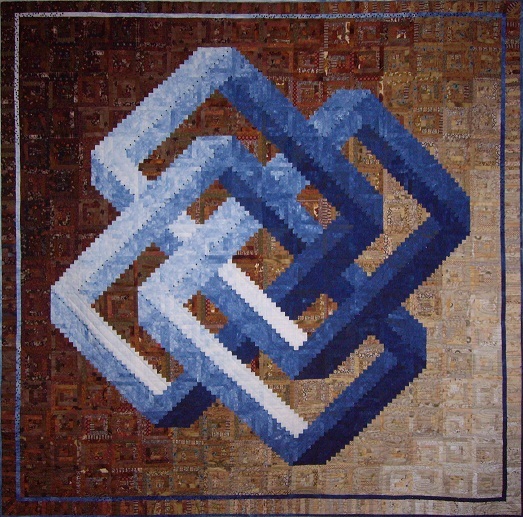 -CQA/ACC, National Juried Show 2009 Excellence for Traditional Wall quilt: Honourable Mention.